Douglas Glade Thomas, or as he liked to call himself “stud muffin” passed away unexpectedly on Friday, August 3rd, 2018 at the age of 64. Doug was born to William Ferrel Thomas and Mary Lois Andrews Thomas on March 6th, 1954. Just like he left us unexpectedly, he came into this world unexpectedly, being born at home right after the doctor had sent his mom home. The doctor told his mom that Doug wouldn’t be coming any time soon, and so his dad went back to work. Shortly after, Doug decided it was his time to come into this world. His oldest sister had to run next door for the neighbor to help deliver him into this world. Doug grew up in Bountiful, Utah and graduated from Viewmont High School with the class of 1972. He married Linda Roberts on June 27th, 1974. They had three beautiful daughters and later divorced. He married Nancey Burbank on February 9, 2000 and gained a stepson, Eli Burbank. They later divorced, but remained great friends and lived out Doug’s dream of living near the beach and ocean. Doug lived life in his own way. He was notorious for his heart of gold, sense of humor, and easy smile. Doug was an amazing craftsman who built everything from homes, waterslides, and furniture. He was such a perfectionist in his work. Doug would re-do hours’ worth of work if it was even ¼ millimeter off. Doug was always willing to help and share his talents with anybody who needed a helping hand with a project or on their home. We know he is heaven now, busy drawing out plans by hand for hours and already getting to work building things. Best known for his fashion sense, his signature look was his plain pocket T-shirt designed by the fashion house Fruit of the Loom, his Jimmie Johnson, Pittsburgh Steelers, or Ron Jon’s sweaty baseball caps and his flip flops. If it was a special occasion, the beach shirts came out. He was a rabid fan of Nascar (specifically Jimmie Johnson was his idol) and the Pittsburgh Steelers. Doug worked for Meadow Gold Dairy for many years, getting up at the crack of dawn and traveling to dairy farms all over Utah. Doug also started his own construction company as a general contractor and named it Lon-Kelsey after his daughters. Doug was the hardest worker we have ever known, spending all day working and then coming home and building a new home or remodeling an existing home for his family. Doug is survived by what he always deemed his three finest accomplishments, his daughters Loni (Troy) Williams, Lindsey Thomas (like a son-in-law Corey Olson), Kelli (Quinn) Beardall. 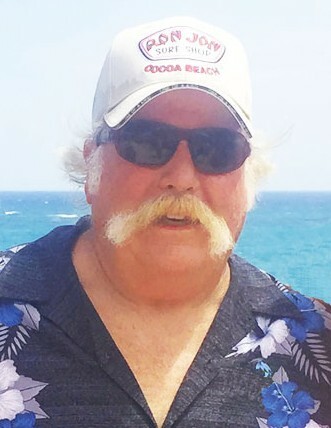 He has 4 grandchildren: Caleb Beardall (14 yrs), Peyton Beardall (11 yrs), Colton Beardall (15 months), and Nash Williams (6 weeks), his stepson Eli Burbank and step-granddaughter Brighton Burbank (9 years), his siblings Sharon (Mark) Stoner, Ferrel (Bonnie) Thomas, Tamara (Mark) Lyman, Kyle Thomas, and Kayleen Thomas. Doug was blessed with numerous nieces and nephews. Also survived by his former spouses Linda Roberts Baker and Nancey Burbank. He was also blessed to have numerous friends and coworkers who loved him. He was preceded in death by his parents William Ferrel Thomas, Mary Lois Andrews Thomas, and his brother-in-law Mark Stoner. A viewing will be held at Anderson & Goff Mortuary, 11859 South 700 East, Draper, UT, from 3:00 pm to 4:30 pm on August 10th, 2018. A remembrance of his life will follow the viewing from 4:30 pm to 6:00 pm at Anderson & Goff Mortuary. Doug will later be cremated, and his ashes will be spread in places that he loved, like among the dolphins in the ocean. A part of Doug will remain with his loved ones and parents in the Bountiful Cemetery. Doug wouldn’t want anyone to dress up on his behalf, so please feel free to wear your flip flops and casual attire. We know you now have the best seats in the house to watch your Nascar and Steelers. We love you Dad!